While it's good to see Nintendo stepping out of its comfort zone, Captain Toad isn't versatile enough to compete in the big leagues. It'd be a budget no-brainer, but feels too slight at a higher price. Shigeru Miyamoto preaches that characters are born from great game ideas, not the other way around. You don't doodle a mascot and crowbar it into a vehicle - that's how you end up with the likes of Knack, Gex and Bubsy, and no one wants that. It's a line of thinking that explains why Mario's stories are so limp - he's just a 'guy who is good at jumping' - and why, in Splatoon, Nintendo currently finds itself making a game about warring squid factions. And it's why Captain Toad is an unusual Nintendo hero: he's a character defined by what he can't do. He can't jump and he can't run fast. You question the sanity of the organisation that promoted him to Captain. You might question the sanity of the developers who decided to give him his own game. A platformer with no jump button? Madness. But trust EAD Tokyo, the masterminds behind Mario's Galaxy, 3D Land, and 3D World to make a decent fist of it. Structures Mario would climb in a few bounds are here swivelled in 3D space to reveal new paths towards the goal star. Hit a dead end? Twist the world to find ladders hiding behind rocks or secret tunnels worming through the bedrock like the world's cheeriest ant farm. Where platforming games have long wrestled with camera woes, Captain Toad cleverly turns the shifting lens into the ultimate weapon. By that same logic it's difficult to get stuck, which could disappoint those expecting fiendish puzzling. No stage is so large that you can get lost - most sit on a single screen in their entirety - and obstacles are only ever a nudge of the analogue stick (or a twist of gyro controls) away from a solution. It's left to level-specific gimmicks to lightly test the grey matter, be it using 3D World's character-cloning double cherries to weigh down multiple pressure switches or pushing blocks and spinning platforms on the GamePad's touch screen. The latter manipulation brings to mind iOS oddity Monument Valley, only without that game's clever Escher-like tricks of the eye - a missed opportunity. Bonus levels pad out the package with new takes on older stages - such as guiding a platoon of four Toads around obstacles ideally designed for one - and a surprise visit to Super Mario 3D World. The latter stages raise an interesting question: how to beat a traditional Mario level without a jump? The answer is somewhat depressing: by putting ladders everywhere. Ever wanted to climb ladders through a selection of gorgeous 3D vistas? Yeah, I thought not. Perhaps it's not meant to be seen as a puzzle game. Taken as an action game it makes less sense. Where Mario's acrobatics allow sublime takedowns, our fungal star can run away, lob turnips, or find higher ground and let gravity pull him into a head bounce. His hopelessness engineers some neat scenarios too - dodging Shy Guys in a hedge maze is a My First Metal Gear Solid - but more often than not results in a repetitive scramble. It's here you notice the lack of improvisation and experimentation that not only makes 'proper' 3D Mario games so fun, but gives you the impetus to return to them. Captain Toad just doesn't have the legs - literally or figuratively. EAD Tokyo counteracts this by hiding three jewels and setting a bonus criteria for every level. Alas, the former are rarely tricky to find - it's hard to squirrel away gems when players have 360-degree camera control - and the latter are hit-and-miss. Being asked to beat a stage without being spotted by enemies or with restricted touch screen usage forces deep engagement with the game's best ideas, but the large number of 'collect X coins' or 'don't take damage' stages are far less exciting. Still, you take what you can get: with the story mode easily beaten in five hours, you'll want to hunt every extra to get value for your money. 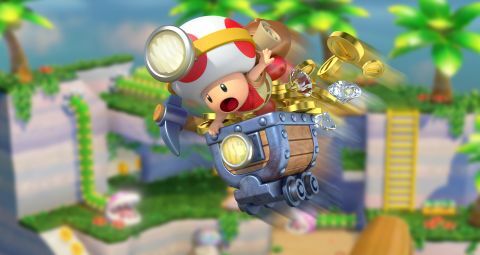 Boiling down a game to cold, hard cash seems crude, however, especially one as beautifully made as Captain Toad. What stages lack in challenge, they make up for in conceptual loveliness: giant pachinko tables bleep and bloop, ornate palaces sprout from the ground, giant wind-up children's toys gyrate wildly and blocks of shimmering water float in the air is if held in by invisible glass. Play it on the GamePad screen and there's a real sense of these being physical playthings to be turned over and marveled at in your hands. And Captain Toad himself is the adorable cherry on the cake, packed with hilarious animations you'll be wanting to use the zoom button to ogle. Captain Toad's charm is undeniable, but it's only ever surface detail - exactly the kind of character-led design Nintendo spurned in the past. That the game itself is a confused offering is perhaps explained by it being an expanded take on a mini-game that appeared in last year's Super Mario 3D World. There, amongst a hundred levels of high-stakes platforming, the ever-grounded Captain Toad was a kooky palette cleanser. But Treasure Tracker is a game in desperate need of palette filler. Too beautifully crafted to dislike, but too insubstantial to love, Captain Toad feels like Nintendo hitting a rare design dead end. Sadly, no amount of camera twisting will fix that. Description As Toad you'll mine for different treasure across different landscapes.